As May is National Bicycle Month, we thought we would offer some drop-in lesson ideas that included the bicycle! Just as bloomers earlier in the century caused a ruckus, so to did the riding costumes of the bicycle era. Explore changes to women’s attire and how that corresponded to other movements such as the women’s rights movement, technological advancements, and efforts to improve health and wellness. Check out these historical Fashion Magazines from the Library of Congress. Ad for Sear’s Catalogue, Women’s bicycle suits, 1897. Ad for Eureka Health Corset, 1880. This entry was posted in U.S. History and tagged culture, fashion, health and wellness, nineteenth century, society, women on May 17, 2013 by jbcosca. Early victories for the Suffrage Movement came in the efforts for state enfranchisement. The West played a particularly important role in this approach. The states west of the Mississippi were the first to grant women the right to vote. This can be attributed to the rapidly growing population filled with often more progressive businessmen, farmers, ranchers, politicians, and independently minded women. Graphic by Bertha Margaret Boye, 1911. California suffragists in particular launched a spectacular campaign of displays, graphic artwork, famous supporters, and immense hands on efforts to get the men of California to vote “Yes” in 1911. Ultimately, it was a tight win at an average of one vote in each precinct tipping the scales in favor of suffrage. In addition to the state by state approach, movement leaders realized that a national amendment was necessary for the entire nation to achieve voting rights. Not only was the state approach costly and lengthy, but some states (such as those in the South) would most likely never grant women the right to vote. Therefore, Alice Paul and Lucy Burns, influenced by European Suffragists and the women of the Western states, staged a suffrage parade in Washington D.C. for the day before Woodrow Wilson’s inauguration. This parade led directly to the reintroduction of the suffrage amendment and the establishment of the the National Woman’s Party (NWP), the more radical arm of the movement. For a more in-depth look at the various groups and parties of the Suffrage Movement, check out our lesson plan “Ideas and Strategies of the Woman Suffrage Movement” adapted for Middle School, High School, and University students. Poster: “The Woman’s Hour has Struck…Woman Suffrage is Coming” 1917. Poster: Woman Suffrage, “WE GIVE OUR WORK, OUR MEN, OUR LIVES IF NEED BE” 1917. Essay from the Nation Women’s History Project on California’s campaign for suffrage. For an international component check out “Suffragettes to She Devils: Women’s Liberation and Beyond” by Liz McQuiston. This book features some truly amazing images from the Suffrage Movement worldwide. This entry was posted in U.S. History and tagged fashion, nineteenth century, suffrage, women, Women's Rights Movement on March 14, 2013 by jbcosca. 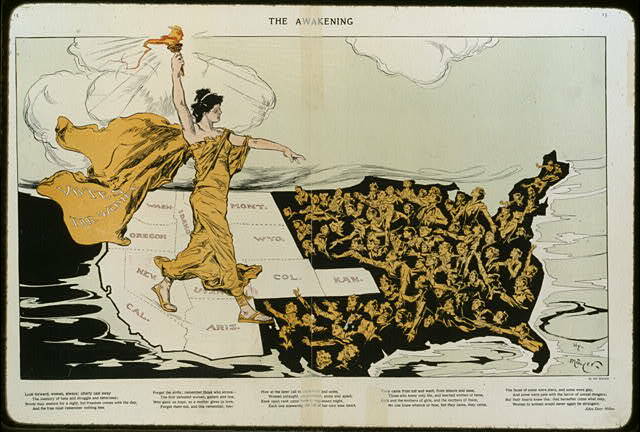 Part 2 of the Women’s History Series on the early Women’s Rights Movement highlights some of the cartoons that opposed suffrage. The call for women’s suffrage met with strong anti-suffrage rhetoric. Not shy of using strong language, ads and cartoons from the late nineteenth to early twentieth century typically portrayed the fears and expectations of a voting female population. Cartoon: “The Age of Brass/or the Triumphs of Women’s Rights” 1869. Cartoon: “An Inauguration of the Future” 1897. Ad: “Which do you Prefer? The Home or Street Corner for Woman: Vote No on Woman Suffrage” 1915. This entry was posted in U.S. History and tagged anti-suffrage, fashion, nineteenth century, suffrage, women, Women's Rights Movement on March 13, 2013 by jbcosca. Continuing our discussion on the Women’s Rights Movement of the nineteenth century, today we highlight the efforts by advocates to change the everyday lives of women. In particular, the clothes they wore. One of the controversial aspects of the early movement was the introduction of “bloomers.” Named after Amelia Bloomer editor of The Lily, but first worn by the Oneida community, these loose pants under shorter skirts drew intense negative attention from society. Often cartoons linked these garments to unsavory behaviors for women such as smoking and chastised those who chose to don them. This entry was posted in U.S. History and tagged anti-suffrage, fashion, nineteenth century, suffrage, women, Women's Rights Movement on March 12, 2013 by jbcosca.